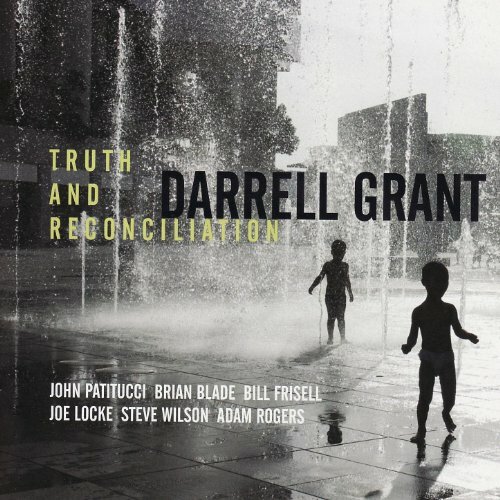 Critically acclaimed pianist/composer Darrell Grant (Betty Carter, Tony Williams, Roy Haynes, Greg Osby) describes his 6th CD as a leader as his "dream project." The 2-disc set joins Grant with bassist John Patitucci and drummer Brian Blade, and features guest appearances by Grammy-winning guitarist Bill Frisell, vibraphonist Joe Locke, saxophonist Steve Wilson, and guitarist Adam Rogers. Grounded in jazz, Truth and Reconciliation brings together influences ranging from classical to folk and soul. In addition to showcasing the masterful piano artistry that took Grant's 5 previous albums to the top of the radio charts, and earned his debut "Black Art" a selection as one of the Top 10 CD's of 1994 by the New York Times, Truth and Reconciliation highlights his unique voice as a composer on the album's 9 originals; and features deeply personal re-workings of jazz tunes - Dizzy Gillespie's "Algo Bueno," Betty Carter's "Tight," the Jerome Kern classic "The Way You Look Tonight," pop anthems - Sheryl Crow's "I Shall Believe," and Sting's "King of Pain," as well as showcasing Grant's vocals, which are reminiscent of Keb Mo and Milton Nascimento. Into this mix Grant masterfully weaves archival spoken word excerpts from historical figures like Gandhi, JFK, FDR, Mandela and Martin Luther King Jr. Inspired by Grant's own reflections on artistic truth, and profoundly influenced by his study of the struggle for justice and healing in South Africa, Truth and Reconciliation seamlessly dances between piano trio, quartet, quintet, and vocal settings, paying homage to mentors, honoring truth tellers, and celebrating beauty. It is a definitive statement by a definitive artist.